Combine onion, a full can of chipotles in adobo, 4 cloves garlic, 2 tablespoons molasses, a cup of orange juice, and a cup of white vinegar in the food processor make up the braising liquid. Roast at 250 for about 7 hours. Remove from the oven and place in the fridge for about an hour to cool and harden a bit. This will prevent it from falling apart when you slice it. When you remove it from the fridge, the fat in the pan should also be hardened. Remove the fat and place the remaining braising liquid in the food processor again with some honey. It will become smooth and slightly sticky, perfect for a glaze. Slice the jowl thick against the grain. Remove a little of the fat, but keep most of it because at this point it is meltingly tender and very tasty. Sear the pieces of jowl on all sides in some hot oil and at the last minute, add your sauce to the pan to glaze the pieces of jowl. Remove from heat. Brush with sesame seed oil. Indent middle of circle with chopstick. Fold circle in half so that it becomes a half moon. Crimp edges tightly with fork. Steam, tightly covered, over briskly boiling water for 10 minutes. May be prepared in advance. May be frozen. Thaw out in plastic bag and re-steam 10 minutes. 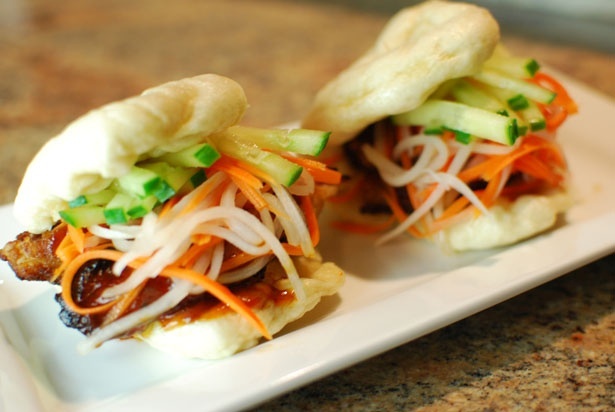 Top the steamed buns with the pork jowl filling, cucumber sticks, pickled carrot and shredded daikon radish.